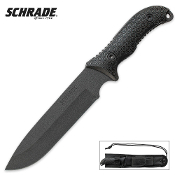 The Schrade Frontier Extreme Survival Knife is one of the toughest knives around. This Frontier extreme survival fixed-blade knife features hefty full-tang 1095 high carbon steel construction with a black powder-coated finish. The textured TPE handle provides a rugged, slip-free grip with spine jimping. The exposed tang of the blade has a pre-drilled lanyard hole for on-the-go use, and a black nylon belt sheath complete with a ferro rod and sharpening stone is included. The 7" blade makes fast work of all your slicing, cutting and light chopping needs, and the sturdy construction will withstand the test of time. Designed for the serious outdoorsman!